I'm so happy you stopped by my blog for the Patchwork Patterns 318 Blog Hop! Patchwork Patterns 318 is a Japanese sewing book by Kumiko Fujita. It has recently been published by World Book Media for the first time in English! The book is written for hand sewing but can be easily adapted to sewing on your machine using foundation paper piecing or freezer paper piecing. I decided to make a few projects from the "Girls Night Out" section of the book. The patterns are adorable and the perfect designs for embellishing some very practical items. 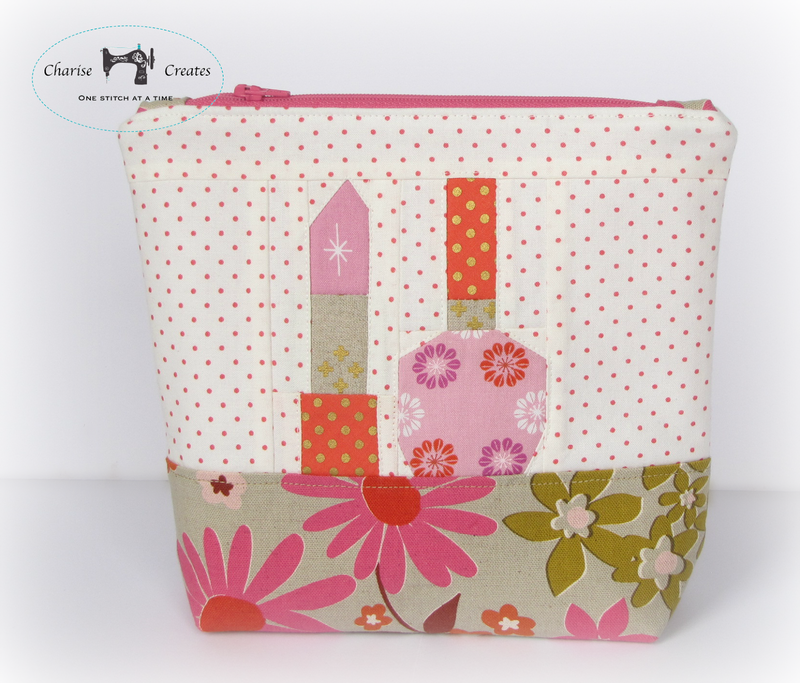 I couldn't resist making a make-up bag - perfect for the lipstick and nail polish block! The fabrics used for the lipstick and nail polish are Cotton + Steel Mustang Collection. The large floral is a cotton canvas designed is Ruby Star Polka dot in Pink by Melody Miller. The background dot is Essential dots in Pink from Moda. 2 3/8" and are not reversed for paper piecing, so I scanned the image and used Adobe Illustrator to enlarge and reverse the image. I added a seam to make the piecing a bit easier and numbered each section. If you don't have Illustrator you can use Photoshop Elements as well. Kerry has a great tutorial for sizing the blocks which you can find here. Ruby Star Polka dot in Pink by Melody Miller. The background fabric is Essex Yarn Dyed Linen from Robert Kaufmann. Now for the fun part!!! I will be giving away one copy of Patchwork Patterns 318 compliments of World Book Media and a FQ set of Mustang from Cotton + Steel from Fat Quarter Shop! Don't forget to take a peek at the New Cotton + Steel line at Fat Quarter Shop. Please leave a comment below sharing whether or not you have tried foundation paper piecing. If you have tried, what did you make? Give away is open to USA and International commenters. Comments will be open until Friday 9:00 p.m Pacific Standard Time. And.... be sure to check out the other projects on the blog hop - they are wonderful! I love foundation piecing! Most recently I made a sea horse using a wonderful pattern by Johanna from Shape Moth. Thanks for the amazing giveaway! I did do some freezer paper piecing to make a strip quilt back- it was easy and fun except for the tearing of the paper off part. I love that shoe block- so cute! The designs in this book look like so much fun! I have done foundation piecing and loved it! I especially like how neatly and accurately the block can be assembled. Thanks for the chance to win! I have done a bit of paper piecing. Love the blocks I've seen so far from this book! I have tried it several times, I love it. I tried to find a copy of this book a few years ago, so,I'm pretty to see that it has been reissued. I have never tried it, but would LOVE to! Thanks for the chance to win such a WONDERFUL giveaway! I have not tried paper piecing but after seeing your AWESOME pattern I am soooo eager to try and make your lovely blocks! Thanks for sharing! I'm obsessed with paper piecing. I've done Mermaids, girls, santa, bears, stars, a tardis, oh so many. Would love a chance to win. I'm an avid follower on IG. I've done Christmas coasters and a bug quilt for my daughter with foundation paper piecing, such fun. Your projects are fantastic!! Thanks for the opportunity! Love to paper piece! Thanks for a great giveaway! I have done some paper piecing right now I'm working on a row of the month at http://www.dodmystery.blogspot.com/ which has some paper piecing with it and it's so fun! I haven't seen this fabric line in person yet and hope to become best friends with it. I love paper piecing but sometimes have a hard time getting the patterns enlarged to the size I need. I have made some projects that are paper pieced in Ayumi's book, Patchwork Please. I've made a Christmas tree block that was paper pieced for my quilt group swap. Love that FQ bundle!!! I love what you made with these blocks. I haven't tried foundation paper piecing yet, but it's on my to do list. I've made some stars and I absolutely love foundation paper piecing. Thanks for the chance to win this amazing book! I love foundation piecing especially by hand while watching tv. I would love to try foundation paper piecing. It looks like a lovely book. I love paper piecing and at the moment I am sewing patterns by Claudia Hasenbach (http://www.claudias-quilts.com) to make a quilt. Love your projects and the fabrics you used. I have, I made your beautiful sewing machine pattern! I have just started hand piecing too so would love to try some of these fun patterns! I have been pinning patterns for a while and would love to have a go soon. Those patterns are very sweet and I may try the cos ethics bag pattern. I've tried foundation paper-piecing many times:) but - unfortunatelly - I don't have many finished works. Maybe I should make some things smaller than quilts from my blocks - like you! I find paper piecing to be quite a bit of fun ! It is especially handy as I make blocks for my Farmer's Wife Sampler Quilt. Thank you for a chance to win. The first quilt class I took was a paper piecing class and it was flowers and stems/leaves. It didn't scare me off...I still enjoy quilting and paper piecing when needed. I do lots of paper piecing but the projects are always small..... little wall hangings, pincushions, etc. Thanks so much for the giveaway! I haven't done paper piecing. I have wanted to learn. This book and fabric would be great for me to start. I really enjoy paper piecing and have made several projects. My first big project was a wall hanging which was comprised of traditional 6 inch blocks. I have made a couple of pouches with foundation paper pieced designs - I really enjoyed it! i first tried paper piecing when i saw the pattern for your designer studio, love it. I have fallen in love with paper piecing, but I do love hand stitching too!! I have used two of your patterns for my initiation into paper piecing, the jam jars, and berry fruit basket and loved both. I think my next one will be your mini cottage houses for some Christmas ornaments and gifts!! 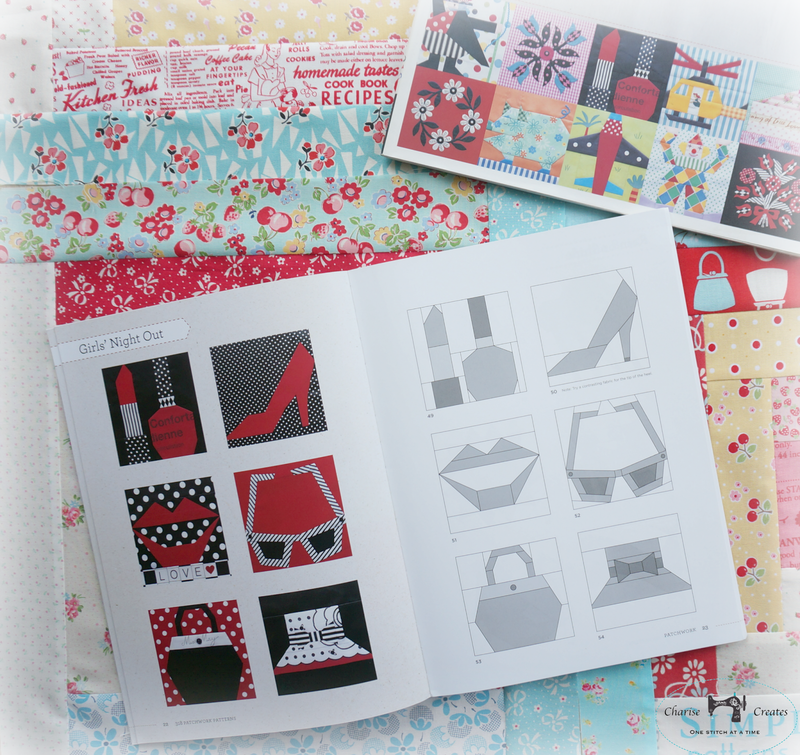 Thank you for the chance to win this book and nothing is prettier than these Cotton + Steel line of fabrics. I've been paper piecing since 2006. I absolutely love it. I've barely done any other sewing since. Most all my projects are designs from Sewhooked, Quit-art designs, Fandom in stitches, and of course your work! I've recently been enjoying vintage paper piecing projects. Thank you for the giveaway and happy sewing. 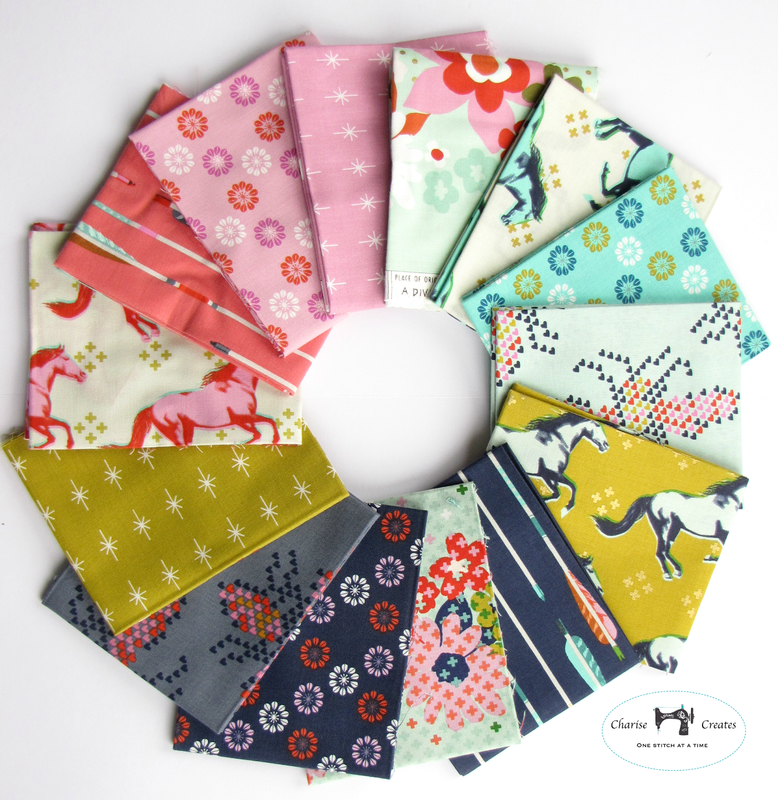 I just love your ability to fussy cut the perfect fabrics in the best possible way! I have tried foundation paper piecing twice, once for the side of a large tote bag and then for an economy block mini. I really like the technique. I have done a few projects - nothing too involved and would love to learn and do more! thank you! Handsewing is not for me but you know I love me some paper piecing! HELLO, yes I have done some PP and liked it. Latest was a Tulip pattern for a wall hanging>so pretty+intricate! I really enjoy paper piecing and at the moment I'm working on a Lego Captain Rex (the things Mothers do!!). The book looks fabulous for ideas. I have admired the projects, read the tutorials, and even bought patterns....but I have not tried it, yet. I have done a little paper piecing and I'd like to do more! These are adorable! I've done a little paper piecing and hope to do a lot more. It's so fun and fulfilling, and sometimes a bit of a challenge. Thank you for the giveaway! Wow! Your projects are awesome and I absolutely love the fabric you chose too! I have only done a few simple paper piecing wall hangings and they turned out really nice... I would love to try the smaller designs like yours. Thanks!! I have done some paper piecing and turned the blocks into quilts, potholders, aprons, bags, etc. Thanks for the chance to win! I LOVE foundation paper piecing and have made lots of differnt blocks. These have been turned into mini quilts, zippy pouches and quilts. I love the shoe - sparkly pink goodness! I purchased Carol Doak's Craftsy class and have watched the lessons several times. I am now ready and very excited to try foundation paper piecing! Your bags are gorgeous! Those patterns are the cutest. I have used paper piecing on lots of projects and love the accuracy it results in. Your bags a sweet as pie. I am just getting into foundation piecing. I am a long time appliquer but the foundation piecing it a great way to use scraps...so I am working on learning how! your patterns are so cute and would be a perfect start! Cute projects! I have done paper piecing. Last project I did was Zen Chic's Prism quilt. I have done paper piecing. I just finished the last block of a SAL from Quiet Play. They were kitchen blocks.l had fun making them. I have sewn and quilted for many years, but never tried paper piecing. I have admired other people's work like your projects shown here (absolutely love them) and would like to give it a try. Thanks for the opportunity. I've made an American Jane wagon wheels pattern using paper piecing, as well as some smaller items. Your bags are adorable ! I recently did a teapot that was a free pattern. I really struggled with the odd angled pieces but finally finished it. It is soooo beautiful. I moved along to personalizing some placemats with names for Christmas gifts. I think everyone will be thrilled when they receive them. I have your jam jars, featherweight sewing machine, summer cocktail and vintage apron from Craftsy waiting their turn. I think I'm becoming addicted. Thanks for sharing your talent on your blog. What cute projects. I enjoy paper piecing though I'm just learning. I recently made some small Christmas stocking ornaments for my guild's charity tree and this summer I made a couple of blocks for a sampler king sized quilt. Now I want to make some fun blocks like your patterns on Craftsy. I've not tried foundation piecing yet but I'd like to give it a go. I'm always interested in learning new techniques. I have done some paper piecing and did have fun with it. I made a small wall hanging for my mom. I have never tried foundation paper piecing yet but I would love to try out the projects in this book! I love the patterns and I love the high heel! Thanks for a chance! 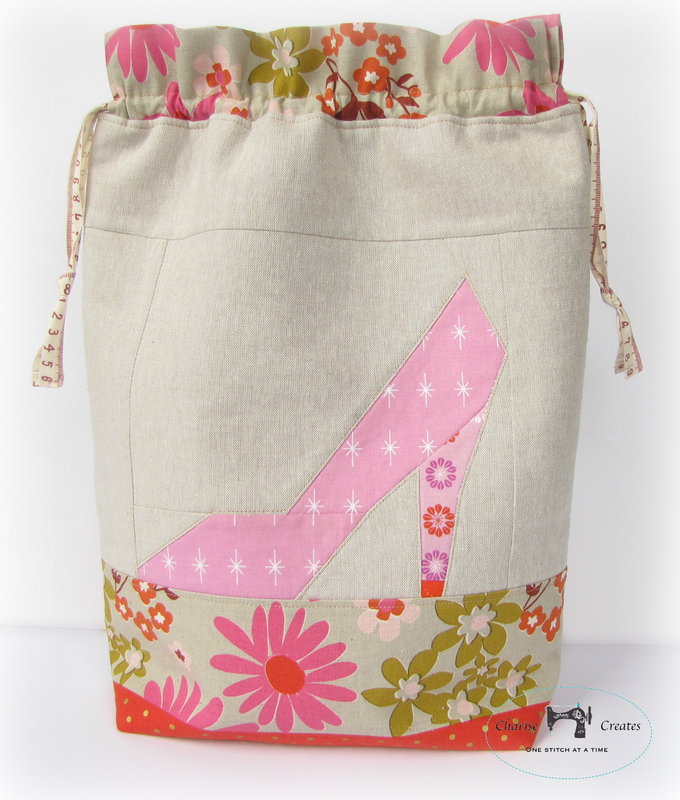 Love the shoe - I want to make something like this as a purse for my very girly niece. I love paper piecing! I have finished a table runner and have everything for a quilt. I have made a cute heart wallhanging and I have a Ginny Beyer pattern in progress. Thanks! I have foundation piecing books but haven't had a chance to use them. One of these days I will have time to sit and piece something. Your pouch and bag is so fun! I have not done any paper piecing but I would love to learn. Thank you for the chance to win! Your bag is simply stunning! I enjoy foundation quilting. My last project was a star quilt. Thanks for the chance. I love paper piecing, I have made some cushions and right now I need to finish two blocks from a sewalong, but I love small projects like yours. A friend of mine made a foundation pattern for The Single Girl quilt and that was my first experience with it. The quilt turned out so wonderful. However, I really prefer paper piecing and I've done lots of it! I even pattern test for a couple of bloggers! Love to see how the pattern with turn out. 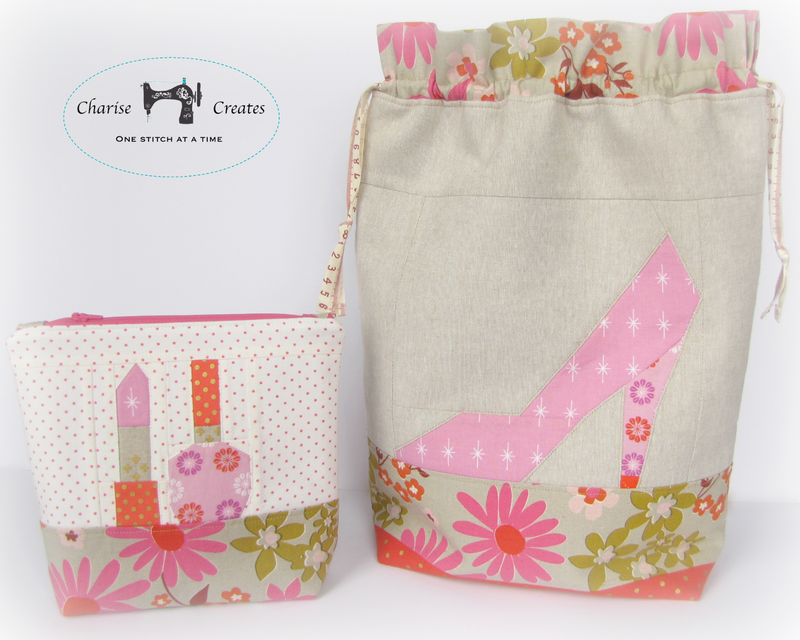 Your bag and pouch a adorable ~ think this would be a perfect gift for the 'girly girl'! I have never tried paper piecing. But my ten year old is eager to learn and so I might have to take the plunge along with her! Love the projects in the book. I have done paper piecing on several projects. One was a small wall hanging with each block representing each month of the year. That was really fun. I've never tried it but I am sorely tempted! The book has some wonderful projects. Thanks for the lovely giveaway. I love paper piecing! My most recent favorite is a Panda pillow I made for my niece. Thanks. I ADORE paper piecing. I've made several things, but my favorite is probably a wall hanging for my mom. I have used paper piecing to make a quilt and a pillow top. I can't wait to get a copy of the book. Thanks for the chance to win. I haven't tried it yet but seeing this book makes me want to do it for everything! Awesome giveaway, I have done Foundation piecing and like it, especially if I can change the patterns up for fun, like you did. I love paper piecing. It's so precise. I've made a potholder and some small blocks. Thanks for the chance to win this awesome book! I love paper piecing and do it often! I have made small things like pouches and table runners and also big things like quilts. With the bigger things I often combine some complex paper pieced blocks with some simpler piecing. I love paper piecing and have made several projects - mug rugs, pillows, quilt blocks. What I am most proud of is a picture of a drum set that I made for my son-in-law. I framed it and he has it hanging in his drum room. Thanks for the opportunity to win! I've not, but this pattern might just be the perfect inspiration! My daughters and nieces would love these bags! :) Thanks for sharing! I did some sample paper piecing. I have not tried it yet but hope to take a class at my local quilt shop soon! I made a small wall hanging of barns with quilt blocks on them! - love the book/patterns! I've never tried it but would love to learn. Never done paper piecing. But I'm sure I will very soon, I just love everything from this book. I have done paper piecing and have made several blocks for a swap and a couple of quilts. Yes I've tried Foundation Paper Piecing ONE time and made a star block, which I entered into NASA's quilts in space contest. Astronaut Karen Nygard is a quilter. The completed quilt w/everyone's submission of stars was to be on display this Fall in Houston at the Space Center. I paper pieced some pink flamingos for a wall-hanging for a friend who loves pink flamingos. Speaking of piecing, I love your projects! The designs and the fabric choices are great! Thanks for the fun! I love paper piecing! I sewed through the book Patchwork Please a couple years ago, which was my introduction to this method. I loved how paper piecing gave me more accurate seams and took away some of the annoying aspects of regular piecing (sewing on bias edges, small inaccuracies in measuring). I am so excited about this reprint. I just finished foundation piecing 120 string blocks for two string quilts. It went pretty quickly. This book looks like it would be a great addition to any quilter's library. I am sorry to say that I have not tried foundation piecing yet, but it is definitely on my list! There just are not enough hours in the day for what I want to do. I would love to win so I could get started on learning a new technique right away! I've made ONE foundation pieced Snow Scene landscape by Cynthia England. I finished it and learned so much about paper-piecing. I still have bits of paper that are stuck in between the stitches! I haven't tackled it since that one project, but the more I read, the more I think, "Yeah, I can do that!" I have done a little bit of foundation piecing. I love this nail polish and lipstick block and do think it would be great for a bag. You picked the perfect fabrics! Paper piecing requires I think backwards so I have to be in that frame of mind to do it. Yours turned out wonderful. I have not tried paper foundation piecing before. Would like to give it a try. No, I've never tried paper foundation piecing... seems tricky but it's worth a try, right? Thanks for the giveaway! I love foundation piecing for precision. I've made a double wedding ring with foundation pieced arcs, among other things. I already have the book, and I love it! But I'd love a chance at these C+S FQs. Your bags above are lovely--great fabric choices! No, I have never tried foundation piecing. On my to-do list, though! My favourite thing that I've paper piced would be the Puffin but he was a bit complicated and he's still waiting to be turned into a pillow. I love paper piecing. I'm currently working on a sampler of PP'd stars. Thanks for the chance to win! I have never tried paper piecing. I do like the color combo though. I have not tried paper piecing but would like to learn the technique! Oh my, those blocks are just so darn cute! I am a huge foundation paper piecing fan, and have done many projects using this technique. Thanks for the giveaway. I've not tried foundation piecing before but I really want to learn because the results always look so great! I have not yet tried foundation paper piecing. This pattern would be a great one to try. Very, very basic paper piecing but I'm getting up my nerve to accept the challenge! Thanks. I have never tried paper piecing but I would like to try it. I haven't tried it, but it looks like a fun challenge. I'd love to try paper piecing. It looks like so much fun! I love paper piecing. These patterns are great to start on if your new to paper piecing. Love your project! And I love foundation piecing. I'd probably make a mini quilt. I just finished the stag from Violet Craft's Forest Abstractions pattern. it was definitely on the difficult side but I love the results. No, I have not tried it yet. But I would love to -- the possibilities are endless! I just started paper piecing this year. With 3 projects in the works, I think you can say I am hooked. Thanks. I have made a few blocks using paper piecing, mainly to see if I could do it! I was pretty good with the inside of the block, but forgot to add the 1/4 inch to the outside so if I ever sew that block to something else the tail of the camel will be lost! I have known about this book in Japanese for a while but was too late to get it in the original - super wonderful if I could get in the English in this drawing! Thank you for the chance! I've never tried paper piecing. I've tried pretty basic paper piecing patterns, but would love to try more intricate ones! I have not tried paper piecing...yet. It is on my bucket list. So far I've done a few bears, a circle of geese pattern from craftsy, and a japanese maple leaf. I love, love, love paper piecing!!! Yes, I have made a couple quilts made entirely from paper piecing! The latest one is a group of blocks from Carol Doaks' books! I also use your patterns, the latest citrus pouch pattern! Love your patterns! Heck Yeah!!!! Love paper piecing!!!! I have done some paper piecing. I like to do it I just don't for some reason. Thanks for the chance to win the wonderful book and fabric. I have made a few paper pieced things - pencil cases and quilts, maybe a few others. I have used paper piecing and it was so much fun! I used them for potholders in clam shell,They look so pretty and I used some cotton print and Duck cloth for strength . Thank you for a chance to win this Fun Ideal Book! I have done one foundation paper piece project that was a sewing machine. I made 2 of them, 1 for each sister with their names on them. I was very pleased with how they came out and it wasn't really that hard. I am totally obsessed by paper piecing! I do all kind of things with PP, quilts, wall hanging, bags, table runners, anything! :) and I design my own patterns too!! Thanks for the chance to win!